Serendipitous: to come upon or find by accident. It wasn’t until he was closer to sending them did he reveal their new nomenclature “zFLOW”, which is short for “Zero Flow Ground State”, an extension of his existing “gZero Architecture”. When he told me he was going to send the KLEI zFLOW33 interconnects and the KLEI zFLOW22 Speaker Cables for my listening pleasure, I had decided the best approach was to install and evaluate the speaker cables first. Primarily because I find having better quality speaker cables normally allows me to better assess any improvements provided by the later introduction of interconnects. By mistake I happened to connect the KLEI zFLOW33 interconnects first and since they were now installed I decided to audition them anyhow with the already well broken-in KLEI gZero6 Speaker Cables in the mix. After playing a few tracks I felt that these new cables were only performing marginally better than my “well matured” KLEI gZero20 interconnects, which I had enjoyed for many months. Now, I am the first to admit that my system is “modestly priced” and as such there would come a day when the resolution limits of my system would be encountered. Could his be the reason for such lacklustre performance? After allowing the KLEI zFLOW33 Interconnects to settle in for approximately 3 days, I still had not noticed any further improvements - which is not the norm for cables from KL - like a good wine they do require some time to “breath” to sound their best. Feeling quite underwhelmed - and wondering exactly what I was going to write about - I decided to install the KLEI zFLOW22 Speaker Cables as well. - i.e. KLEI Zflow33 IC’s with the gZero6 SC’s. A couple of days later and those improvements had really started to reveal some extremely delicate nuances I had never before heard on most of the tracks played. After applying some thought, it was clear that the newly installed KLEI zFLOW22 Speaker Cables were in fact providing a more suitable pathway for the extremely fine details being revealed by the KLEI zFLOW33 interconnects. Case “A” - the KLEI zFLOW22 Speaker Cables sounded very much like the KLEI gZero6 speaker cables - any improvements were marginal at best. Case “B” - the KLEI zFLOW33 Interconnects sounded very much like KLEI gZero20 Interconnects - again, improvements were simply marginal. AND - both Cases seemed to offer a very similar, almost identical, level of fidelity. I considered these observations as being below “the norm” with respect to my previous observations experienced for all other KLEI cables auditioned. Basically, I expected more from their individual use! Using the two zFLOW products together seemed to allow my system to resolve to a higher level. With that realization, I installed both sets of KLEI zFLOW cables and allowed them time to settle. During the “settling time” I did play music, but I did not really sit down to seriously “audition” the cables. There were a few moments where I detected some improvements, but it was not really enough to make me stop what I was doing and listen more intently. It wasn’t until about day 6 in the settling cycle that I began to hear significant improvements that really peaked my interest. Finally, The level of improvement I had previously come to “expect” from installing KLE Innovations products was starting to materialize! However, rather than a marked improvements in dynamics, or image size, or bass performance etc.., the most noticeable of the improvements was clearly the level of refinement these cables were able to convey. Now, if you feel that I’m a little “less enthused” than in most of my other reviews, please remember that my point of reference for this review is the KLEI gZero20 Interconnect and the KLEI gZero6 speaker cables, which have proven to be exceptional performers. So what exactly were the improvements? The KLEI zFLOW cables have an ability to convey an extraordinary level of detail - this was clearly demonstrated by a significant improvement in the reproduction of subtle reverberations in venue acoustics and extremely delicate nuances of vocal performances. The improvements in detail and clarity has also improved upon the already superb imaging of the gZero20/gZero6 combination, but added more depth to the image and simply dissolved the confines (i.e. walls) of my listening space. An enhanced realism across the entire image provided more space around artists and instruments together with their individual localized reverberations. The detail and clarity also contributes significantly to an extended bass performance, which not only goes lower than ever, but reveals textures in the bass line that up to know were only ever heard in the live performance. And lastly, strange as it may sound - the detail and clarity seems to have improved upon the dynamic performance. Perhaps the human ear is capable of detecting details so fine that even in the crack of a snare drum or the plucking of a string, they appear to make every performance noticeably “crisper” than before. Nellie Furtado - these cables highlighted her extremely varied vocal tones, from her edgy grittiness, to the softest and delightfully tranquil passages. The extremely dynamic and deep synth work on certain tracks went very deep and divulged many more bass textures. Diana Krall - Diana’s vocal acuity was simply brought to a whole new level of “seduction” and the perceived reality of having her perform right there in my living room was surreal. Jason Mraz’s album - “Yes” - has never been so soulful and engaging with some superb instrumental and vocal textures that highlighted the superb sound engineering. Miroslav Tadic’s album - “Window Mirror” is one of the first albums I play because of the superb sound engineering used in a live venue recording - the venue acoustics were the best I’ve ever heard them - Miroslav’s guitar playing is none too shabby either - just a superb album. A cacophony of sound from all of the various keyboards & pipes in play is superbly reproduced in amazing clarity, from quietest passage to the loudest crescendos - and I played it LOUD! even the most delicate sounds are brought to your ears with amazing clarity and detail. So what princely sum will get you these hand built Cables? Since these cables are yet to be formerly announced I can only state a “provisional price” provided by Keith Louie. Price/Performance to this level of fidelity - represents VALUE! 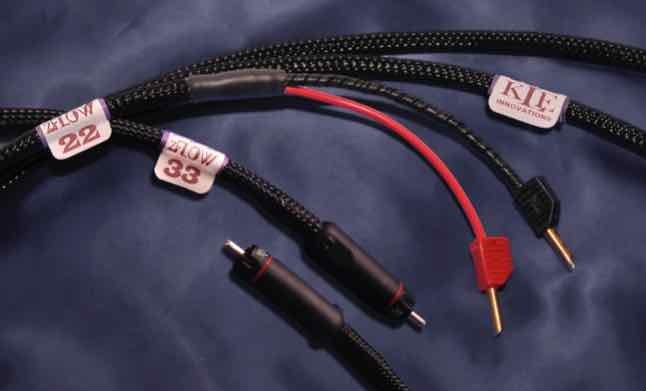 It was very fitting that KL decided to give the zFLOW cables their own name, since they clearly perform to a higher level of resolution than the KLEI gZero product line - a very special achievement indeed. How much better than the KLEI gZero product line are they? Well, If you already own the KLEI gZero20 IC + KLEI gZero6 SC combination, like myself, you may assess their initial performance to be “Marginal”, but that is very dependent on the other system components, your ears and your listening space! I was very fortunate in that the cables I auditioned had already undergone a long burn-in period, therefore new cables will require some 300-400 hours of burn-in - even then, they will continue to improve over time. So give them adequate time! Will they offer better performance on components of higher resolution? - undoubtedly! On my system the improvements started out very subtle, but discernible and after a few days of settling, I found them immensely enjoyable. I also have a feeling they will continue to improve over time just as the KLEI gZero products do. Attempting to upgrade to cables having the capabilities of the KLEI zFLOW product range from any other manufacturer will most certainly cost you considerably more and to be honest, I believe attempting to find better performing cables could prove to be a very time consuming lesson in futility. Without a doubt, the KLEI zFLOW product line is clearly KLE Innovations best performer (to date) and it deserves to be crowned as their new “Top Of The Line” without any reservations - that’s the opinion of this reviewer at least. These cables don’t simply improve on “metric performance”, i.e. the dynamics, imaging, the clarity etc., they provided an astonishing level of refinement and allowed my system to convey the most realistic performance I have heard to date. They achieve a very “life-like” reality. A highly recommended product Line!